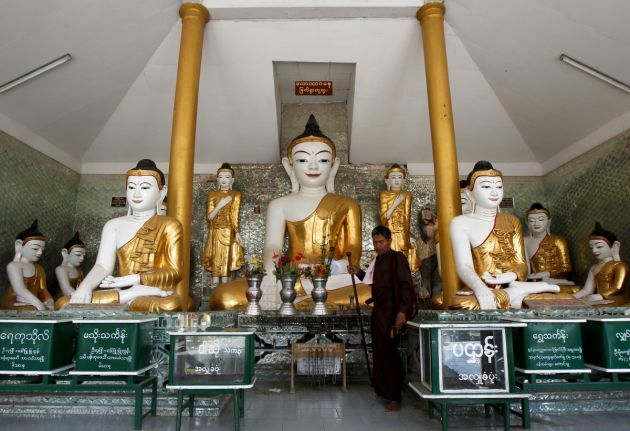 (Photo: REUTERS / Chaiwat Subprasom)A man walks in front of Buddha statue after praying at the Kyaik Khuauk Pagoda in Thanlyin, south of Yangon February 22, 2014. Authorities in Myanmar have detained a New Zealand bar manager and two local citizens after accusing them of "insulting religion" for posting a headphone-wearing Buddha on Facebook to publicize their night spot. Buddhists in the once-reclusive country took offense on the V Gastro Bar's advertisement which its bar manager, Philip Blackwood, posted on the social media site. It showed Buddha wearing headphones, NBCNews reported. Blackwood, 32, has since been arrested and detained, pending prosecution. Two Myanmar citizens - bar owner Tun Thurein and worker Htut Ko Ko Lwin – were also placed in custody. Though the page administrator took down the purportedly offensive image, and issued a subsequent apology, authorities shut down the night spot, located in an upscale Yangon neighborhood. Myanmar is slowly shrugging off its isolation from half a century of military rule, but some Facebook users were enraged by the photograph, condemning the action as offensive. "This is insulting Myanmar, Buddhism and 500 millions Buddhists around the globe," said Facebook user Htet Naing Win in response to the bar's post, in a more tempered tone compared to other comments. Since opening up to the world a couple of years ago, Myanmar has seen a wave of Buddhist nationalism on the rise, fomented by a powerful group of monks. Some monks fear that Buddhist culture, which is deeply ingrained in Myanmar's psyche, is under threat by Western culture. These monks are supporting by what human rights activists deem as restrictive and controversial laws. Groups such as Human Rights Watch and Amnesty International have criticized the case, saying Blackwood's prosecution showed the government appeared to be backtracking on its reforms. The groups also pointed out that the hardline nationalist monks appeared to hold sway over law and politics in the country. Authorities detained Blackwood at the notorious Insein prison. Lawyers are anticipating a lengthy prosecution of the New Zealand expatriate, who faces a possible maximum four-year jail term for the offense.